The Statistical, Economic and Social Research and Training Centre for Islamic Countries (SESRIC) signed a Memorandum of Understanding (MoU) with the World Bank to initiate and facilitate statistical collaboration and cooperation between the two institutions. The MoU was signed by H.E. Ambassador Musa KULAKLIKAYA, Director General of SESRIC, and Ms. Haishan FU, Director of Development Economics Data Group of World Bank on 19 July 2017 in the margins of the Special Event on the ‘Data Revolution for the Sustainable Development Goals’ at the 61st ISI World Statistics Congress in Marrakech, Morocco. 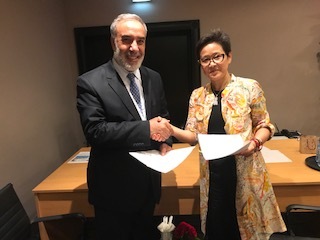 The main objective of the MoU is to collaborate in carrying out activities conducive to help OIC Member Countries improve their statistical systems to collect, process and disseminate relevant, quality and timely data for evidence based policy making to achieve their national development goals and strive towards the Sustainable Development Goals.